Takeaway: Preventing cold-related injuries is all about wearing the right kind of clothing and gear. When you're at home, cold weather can mean hot chocolate and hanging out by the fireplace. But at work, it's usually a safety challenge. Anyone who works outdoors during the colder months faces the risk of cold-related injuries, whether they're part of a construction project, a snow cleanup crew, or an emergency response team. Dressing for the weather is essential when working outdoors. Just trying to put up with the cold and "power through it" won't just be uncomfortable; it can lead to serious complications (learn more in Cold Stress: Your Winter Safety Guide). In this article, we'll go over the basics of winter wear and what you need to know to stay warm and safe while working outdoors when the temperature drops. You don't need blankets of snow and heavy, gusting winds to be concerned with the cold weather. Extreme weather thresholds vary depending on the area you live in and how accustomed your team is to severe weather. Temperature changes throughout the workday can also pose a risk. When it happens gradually, the body may not register the drop in temperature until it's too late. Hypothermia – Hypothermia sets in when the body loses heat faster than it can replace it, resulting in a body temperature that drops below 95°F. In its more mild stages, the affected employee is likely still very alert but shivering and stomping their feet in an effort to get warmer. During the later stages, the employee will stop shivering, lose coordination, and become disoriented. Eventually, the pulse and breathing will slow and they may lose consciousness. Frostbite – Frostbite is, essentially, the freezing of skin and underlying tissues due to exposure to the cold. Symptoms include redness of skin with gray or white patches, numbness. Severe cases may also result in blistering. Trench Foot – Resulting from exposure to wet and cold, trench foot occurs when the body attempts to conserve heat by constricting the blood vessels in the feet. This constriction causes the skin to die from lack of oxygen and nutrients, combined with the build-up of toxins. Symptoms include redness, swelling, numbness, and blistering. Each of those are terrible conditions to suffer through. But there's some good news: these injuries are entirely preventable with proper precautions and protective attire. Dressing for cold weather means more than just pulling on a pair of gloves and a hat. There are a lot of ways to keep yourself warm and functional even in the middle of winter’s worst. Layers are great for balancing colder mornings with warmer afternoons. Layering your gear allows you to remove extra layers as it warms up and add them back on as the sun goes down. 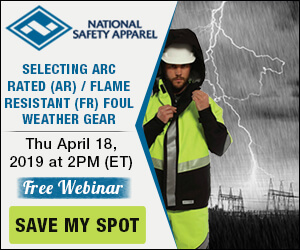 Be careful, however, not to compromise your safety by covering up high-visibility or flame-resistant apparel (find out How to Layer Your Flame-Resistant Clothing). Wind-resistant, water-repellant gear makes an excellent outer layer as it limits the effects of elements beyond the cold. Make sure that your outer layer is well ventilated to prevent overheating. Insulated layers (generally fleece or wool) act as a kind of shield to trap heat against the body. It is best to consider a light fleece garment beneath a heavier fleece or wool sweater. Wicking layers are closest to the skin and necessary to prevent the body from cooling by absorbing sweat (see 3 Ways Moisture-Wicking, Flame-Resistant Fabrics Can Improve Workplace Safety to learn more). Hats are necessary to prevent heat loss. Add in scarves, goggles, and other gear to protect the face from exposure in extreme conditions. Gloves and mitts may make some workers cringe but they are crucial in cold weather. Mitts offer more protection but may be clumsier than gloves, so consider layering them. By wearing gloves beneath the mitts, a worker can remove the mitts for short periods to do more dexterous tasks without completely exposing the skin on their hands. Socks are probably a no-brainer, but do you layer them too? Wearing two pair of socks – one made of moisture-wicking material and the other a heavier wool or synthetic option – provides optimal cold weather protection. When layering socks, make sure you don't constrict the foot too much. Leave enough room for comfort. Insulated, waterproof footwear might just be the most important part of your winter work wear. Keeping the feet dry and warm is an essential part of preventing cold-induced injuries (learn how to Manage Cold Stress with the Proper PPE). When assessing weather-related risks, don't forget to account for some of the other factors that can compromise cold weather gear and cause trouble. Wind Chill – Wind chill is an index that is only applicable for temperatures at or below 50°F and wind speeds over 3mph. It has a significant impact on how quickly the body loses heat. The wind chill can dramatically affect how cold it actually feels outside and should not be overlooked when choosing cold weather attire (find out how wind chill is calculated). Wet Conditions – Melting snow and ice, a rain storm, a water main break – it doesn’t take much for a worksite to turn wet. It is extremely important to stay dry when working in winter weather conditions because wet skin loses body heat far more quickly. Keep spare gear on hand. It may seem like a waste of time and an added burden, but you'll be thankful you have dry clothes to change into if you get wet. If you work outdoors, you can't avoid the cold weather. Cold-related injuries, however, are entirely preventable. All you need is to plan ahead and have the right kind of clothing and gear.